Cape Cloth — T-Shirts. Finally. Cape Cloth was founded on the principle of making the best gear to represent Cape Cod. The last thing we wanted to do was screen print seven letters on a Hanes or GILDAN tee and claim we care about customers. The original sofTEES in Navy and Red, which came out in Summer 2015, took 8 months to debut. Owners still ask about more colors because they love them. They were incredibly soft, but a little too thin because of the rayon percentage. Awesome for Summer, yes, but I overthink things and figured they weren't good enough for year round use, so they were discontinued. Still is cool seeing people wearing them, though. Next came the Foreshore tees, which we beefed up with a little more polyester and cotton over the previous rayon incarnation. They still hold up, but could be softer. The feel still wasn't right. The colors were great though: charcoal, sky, grass, and nantucket red. The time it's taken to develop the right blend of tee has been longer than expected. But, just like anything in life, it's worth it. Our new tees are not only incredibly soft, but they're cut perfectly. 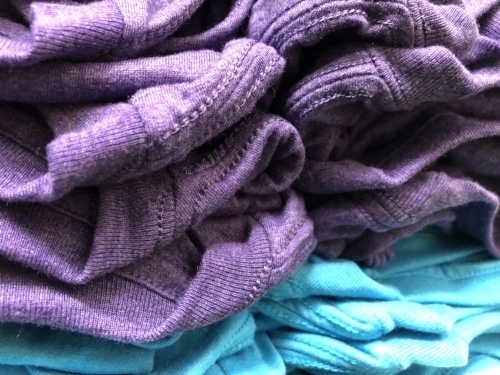 They're slightly longer and more durable than the original sofTEES, and still softer. They come in lots of flavors and the logo size is balanced between the first two t-shirt runs. Not huge, but not miniscule. It's still placed over the heart, because the cape is home. The Softest Tees will be available Friday, June 22nd at Arnold's from 1-4pm on a first come, first serve basis.